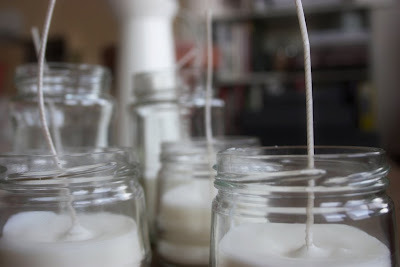 Eco-friendly soy candles in repurposed glass jars. We've got a little DIY going on, but man, does this girl ever sleep? Here are the incredibly practical (and hilarious) instructions. Read 'em for entertainment value even if you don't plan on making the damn things. No, I don't sleep much, but the diy's symptom rather than cause! You don't mind a little needling do you? It's because I <3 you. Not at all. You make me laugh!